Looking for a new color for Fall? Here is what's trending currently in the Beauty Industry! Sometimes a change requires a new type of technique to create the look. Color Melting is one of the newest trend techniques to create a multi dimensional effect. This technique allows for multiple tones to blend together in each section while avoiding harsh lines. This technique of Color Melting can be done with many tones and colors. 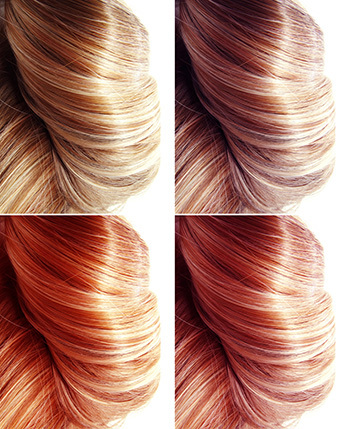 Instagram has been taken over by images of a new color tone referred to as "Rose Gold". It is a pretty delicate shade of rosy pink. A tinted blonde shade that is glowing. It is the most wearable trend out of all the brilliant colors that have been trending and this one is easy to pull off. Think Emma Roberts! Note this French word for Copper because it is now being used all over the place. The Cuivre trend is a rich copper with lots of intensity and very glossy. Great on Medium length hair with pale skin because the color lights up the face and makes features stand out. A deeper shade with combinations of red copper and bronze brown look better on deeper skin tones. But this coppery bronze look is definitely on trend! After many years of "Cool" blonde shades warm blondes are coming back. They are not so icy blonde or beige toned and contain more buttery and sandy tones. Fair skin with warmer tones look great in light golden and honey shades. Just like its name Flamboyage is a beautiful exciting color option. This is a combination of Balayage and Ombre. Accomplished by using the innovative Flamboyage strips that were created by well known hairstylist Angelo Seminara. The component is a transparent color adhesive strip that is used to randomly secure the hair surface. Great because you can check color development during processing time. Great product for creating a more natural looking end result. A lot of you might know the term Ombre, but there is another trending color technique called Balayage. The term refers to the process of "Sweeping" color onto the hair typically using a brush and a color paddle. This technique allows the colorist more freedom to place color and can blend the ombre into a softer more subtle visible outgrowth. The Salon Committed to Change!